Stratford Agri Analysis can analyze soil for its nutrient content and for properties that affect plant growth. When gardeners apply only the amount of elements necessary, nutrient runoff into surface or ground water is minimized, money is saved, and natural resources are conserved. The benefits of a soil test depend on a good sample. The sample should represent the area it is taken from. Otherwise, the results may have little or no value and may be misleading. A soil sample must be taken at the right time and in the right way. The tools used, the area sampled, the depth and uniformity of the sample, the information provided, and packaging all influence quality of the sample. There are two important requirements of a sampling tool. First, it must permit a uniform slice to be taken from the soil surface to a desired depth. 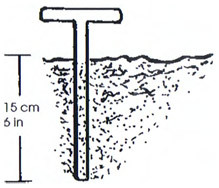 Second, it must collect the same volume of soil from each sample site. 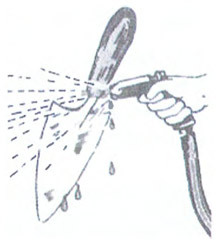 Tools that can be used are a spade or soil probe. A soil probe is the best tool for obtaining soil samples. Push the probe to the 15cm (6 inches) depth and remove the core. Place it in a clean, plastic bucket. If a soil probe is not available, a small shovel or a spade can work satisfactorily when used properly. Dig out a spade full of soil to a depth of 15cm (6 in. ), smooth of one vertical edge of the hole and with the spade take a slice of soil about 1.25cm (1/2 in.) thick. Using a trowel, cut a 1.25cm core lengthwise from the center of the slice while it is still on the spade. Put the core in a clean plastic bucket to be mixed with the other cores from the designated sampling area. Take a soil sample a few months before initiating any new landscaping - whether it be laying sod, starting a vegetable garden, putting in a flower bed, or planting perennials. If the soil test report recommends lime, you will have enough time to apply it and have it adjust the soil pH before you plant. Sample established areas - lawns, trees, shrubbery, and other perennials - once every three or four years. You can sample at any time of year; however, mid-August through mid-September is an ideal time to take samples for cool-season grasses, such as fescue, bluegrass, and ryegrass. By sampling at this time, you can be ready to apply lime in the fall. If an established area exhibits abnormal growth or plant discoloration, take a soil sample right away. For areas recently limed or fertilized, delay sampling at least six to eight weeks. Use a soil probe, spade, hand garden trowel, or shovel to collect samples. Do not use brass, bronze, or galvanized tools because they will contaminate samples with copper and / or zinc. Mix soil cores for each sample in a clean, plastic bucket. 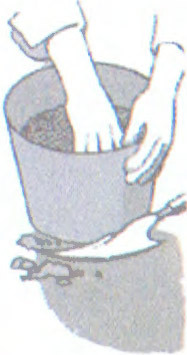 If the bucket has been used to hold fertilizer or other chemicals, wash it thoroughly before using it for soil samples. DO NOT CONTAMINATE THE SAMPLE. Each sample should represent only one soil type or area - for example, a lawn, vegetable garden or perennial landscaped area (Figure 1). For each unique area, take at least six to eight subsamples and combine them to make one composite sample. If one area of your yard seems healthy and another has bare or yellow areas, sample healthy and unhealthy areas seperately even if both are lawn grasses or flower gardens, etc. For lawns, sample to a depth of 6cm (4 inches) excluding any turf thatch. For shrubbery, remove any mulch or surface debris, then sample to a depth of 10-15cm (4 to 6 inches) around the base of plants. Avoid zones where lime or fertilizer have been recently applied. Place all the subsamples for one unique area in a plastic bucket and mix thoroughly. Use the mixture in the bucket to fill a soil sample bag about two-thirds full. Use permanent ink to fill out forms and to label sample bags. Fill out a Lawn & Garden Soil Sampling Submission form and send it with your samples. Give each sample a unique identifier. Put this identifier on both the information sheet and the sample bag. Choose an identifier that will help you remember the area it corresponds to, such as FYARD, BYARD, ROSES, or GRASS. Be sure to list the existing plants and / or the plants you are planning to grow.